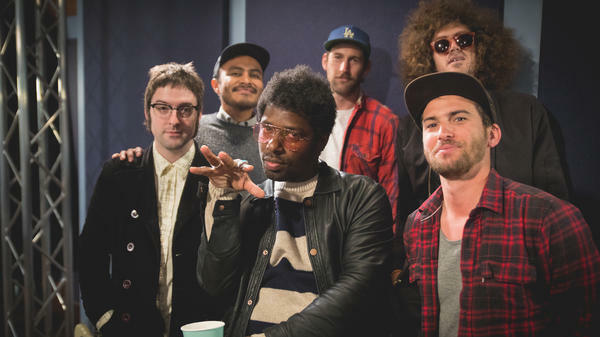 Curtis Harding (center) and his band pose inside the World Cafe Performance Studio. Curtis Harding joins us for a session of soul music. He is from Atlanta, where his career has been developing. Harding released his first album Soul Power in 2014, which helped earn him a fan base in Europe; it was heard by the producer Danger Mouse, who signed on to produce Curtis' new one, Face Your Fear. We'll find out about his fascinating childhood, when he traveled and sung gospel with his evangelist mother. Curtis has also worked with Cee-Lo Green — who is part of another Atlanta-based Danger Mouse project in Gnarls Barkley — and the hooky, melodic pop-soul sound of Cee-Lo is part of Curtis' thing as well. We talk, but check him out live in our studio with "On And On" in the player above.